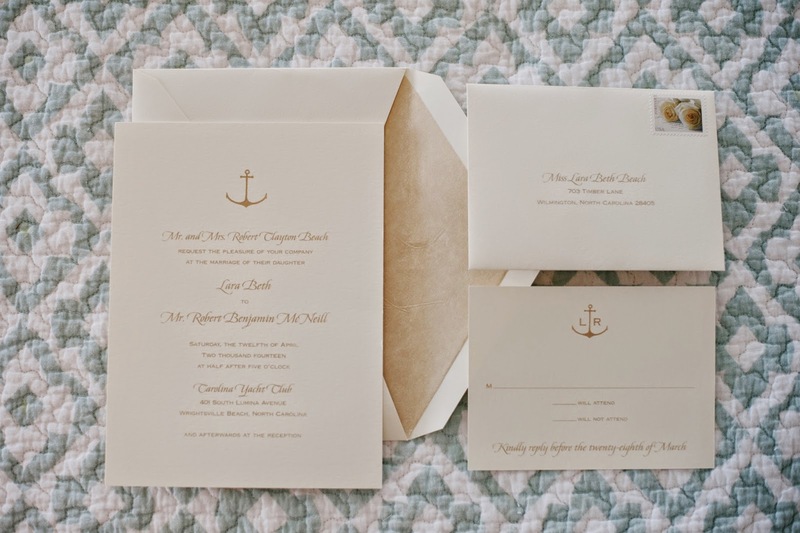 Is it possible to have a nautical-themed wedding invitation and still remain simple and classic? Bride Laura and her groom, Robert managed to pull such a feat perfectly. The couple enlisted the talents of Estelle Baker and Dorothy Bridger of The Fisherman’s Wife to create the couple’s ivory invitation, printed with taupe ink and topped with a charming—yet subtle—anchor motif. Robert and I met through mutual friends in college. He proposed on his grandfather's pier at Lake Waccamaw, NC. 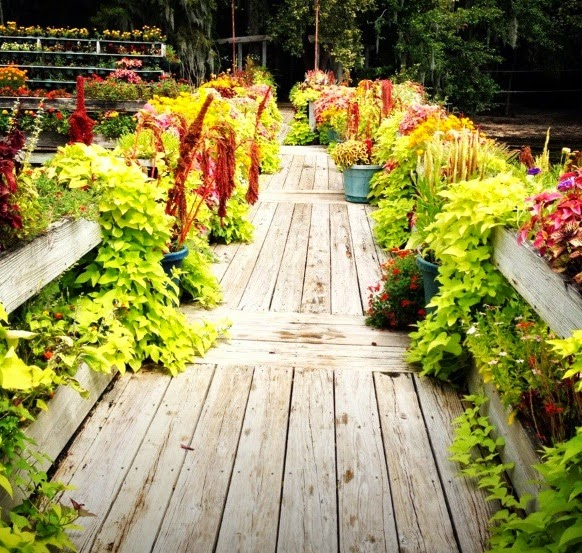 His grandfather plants thousands of flowers on this pier every year and other family members have gotten engaged in that very spot. It is absolutely beautiful and is a very special place for both of us! Tell me about the process of choosing your wedding invitations — did you have something in mind going into your first appointment and did that change? I researched online prior to my first appointment and was drawn to invitations that were simple and not too fussy. 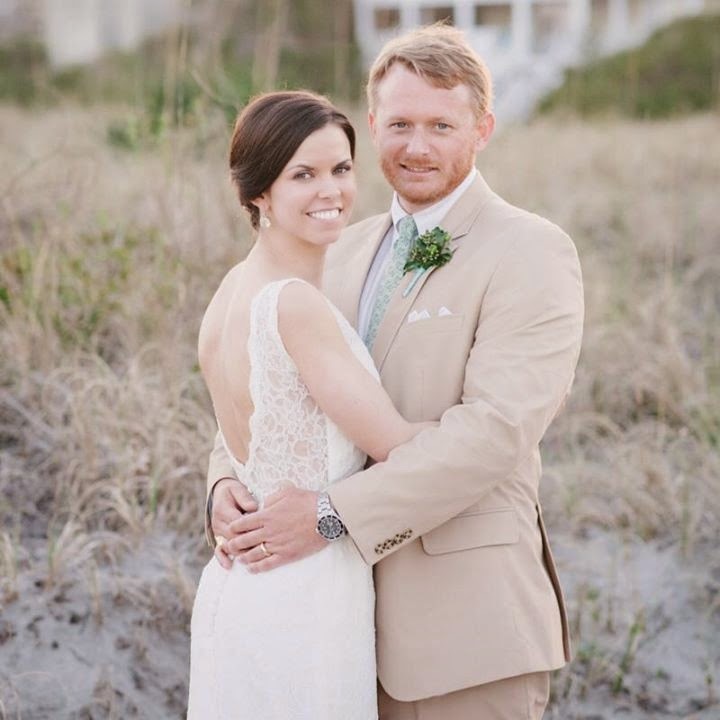 We got married at the Carolina Yacht Club in Wrightsville Beach and I wanted something nautical, but classic. With help from the very talented women at The Fisherman's Wife, I chose a flat ivory invitation with taupe writing. I chose neutral colors for the wedding (ivory, tan, blush pink, sea foam green) and I thought that this invitation complimented them well. I loved the clean lines of the invitation and the simple taupe anchor motif cleverly placed at the top of the invitation, RSVP card and return address. This invitation represented us perfectly! I was surprised at how easy it the ordering process was. We had the invitation designed and ready to send for proofing within 30 minutes. After a few minor tweaks, the invitations were ready to order. I was thrilled with the final design and was beyond excited when they came in! Tell me about your wedding! What were you looking forward to the most? 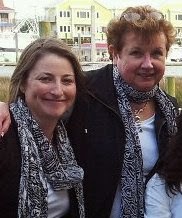 Our ceremony and reception were at the Carolina Yacht Club in Wrightsville Beach, NC. We both love the water and wanted to get married near the beach. We thought that this location was perfect. The bridesmaids were beautiful in long blush pink chiffon dresses and the groomsmen looked handsome as ever in light tan suits. We could not have picked better weather for our wedding day. Our favorite part was that all of our family and friends came to celebrate with us. Robert and I had the time of our lives and I would not have done one thing differently! Tell me about your first meeting with Lara and a little about the process you went through to get to the final decision. Lara was already a customer when we started helping her with her wedding invitation. From the first time we met her everyone in the shop knew that Lara was very special... unassuming, kind and a pleasure to help. Lara is not fussy, so we knew her invitation needed to follow suit. Her wedding was on the beach so we took a cue from that as well. We try to ask questions that help us get to know the bride and learn about her style—traditional, modern or in-between. We also find out the particulars of the wedding—location, time of day, colors, “general feel” of the day that our bride desires. Destination weddings—here in Wrightsville Beach as well as in more tropical locations, influence invitation design. The natural surroundings, i.e. flora and fauna, as well as sea motifs are popular. Lara's wedding was at the Carolina Yacht Club on Wrightsville Beach, so she chose an anchor motif. The Custom Department was so helpful in working with us. Allow yourself enough time to leisurely look at all of the many beautiful choices... paper, ink color, typestyle, lining, etc. This should be a fun decision and we want you to enjoy it! Today's bride often is choosing the invitation with her fiance. In Lara's case, however, she included her parents as well as her fiance's mother in the decision. It was such a pleasure to get to know Lara's parents and to get to spend more time with her future mother-in-law, who was already a special customer of ours. Honestly, every bride is unique, and it is such a privilege to help each one!